I love Margaret Laurence. She’s a brilliant but criminally under-rated Canadian author. As with most Canadians my generation, I first came across her work as a set text in high school. In my case, it was the short story collection A Bird in the House. 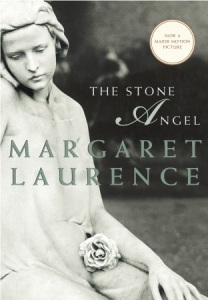 It remains my favourite book by Laurence but The Stone Angel is a close second. The Stone Angel is set in the fictional town of Manawaka; as are A Jest of God, Fire-Dwellers, A Bird in the House and The Diviners. The Stone Angel is the life-story of 90 year old Hagar Shipley who tells it retrospectively whilst living in the house of her eldest son and his wife. Without giving away too much, The Stone Angel is basically about the choices and the consequence therein that women make, the relationship decisions that leave devastation in their wake, and growing old knowing the mistakes made caused those Hagar loved pain. Laurence’s books are a must-read for everyone. All of her books centre around women. In many ways, they are a celebration of women; even when they are self-destructive or self-deluded. They are real, which in a culture which celebrates “reality TV” and “celeb culture, feels incredibly powerful and frightening.